This is the eleventh installment of: “Keep a 5 year Journal.” At midmonth, Tami shares her progress and the list of questions for the upcoming month. Click here to see all 12 months. You did amazing! You should be so proud of yourself for starting and keeping on this journey. In years to come you’ll love looking back at these cards and seeing what your life was like over a period of years, how your taste in books evolved, how your thoughts on a particular week of the year were always the same. I hope that you’ve enjoyed this year preparing and starting a 5-year journal. I also hope you keep it going over the next few years, the hard part is already done! All of the questions are now available and I will check in with you from time to time in 2013. Can you believe it’s going to be 2013 in a matter of weeks? Oy Vey! Did you know we went ‘viral’ on Pinterest? Victoria Fogle of Scraps and Straps saw the questions on Pinterest and jumped into the project. She even has a pretty cool box to case her cards in and her cards… oh her cards are beautiful and bright. I recommend checking out the whole post over on her blog and leaving her a little love and encouragement. And don’t forget to read below if you’re keeping a journal too! Thank you for doing this project. I started in September using a traditional five year journal book. So glad your project is getting more attention. I found your prompts in March and since that’s my birthday month, I started then. I’ve done my writing every day since then, however, occasionally the prompt stumps me. I just make a note and go on. I’m thrilled to get the December list. Thank you ever so much! Is anyone out there keeping their journal online? Mine is posted at http://pzs5yearjournal.wordpress.com. I’m reorganizing it at the moment, but it should be up and running smoothly in a few days here. If you want to share a link to your journal email me at pzg365questions@gmail.com and I’ll post it on my site. thank you for the time that you took to put these together. This Sunday my Sunday School lesson for my youth that are ages 16-18 is about journaling. I have a 10 year journal which sadly to say I haven’t been consistent…but it only had spaces for each day of the year, (10 years worth of spaces on each day) Struggled to figure out what to say in 4 short lines. 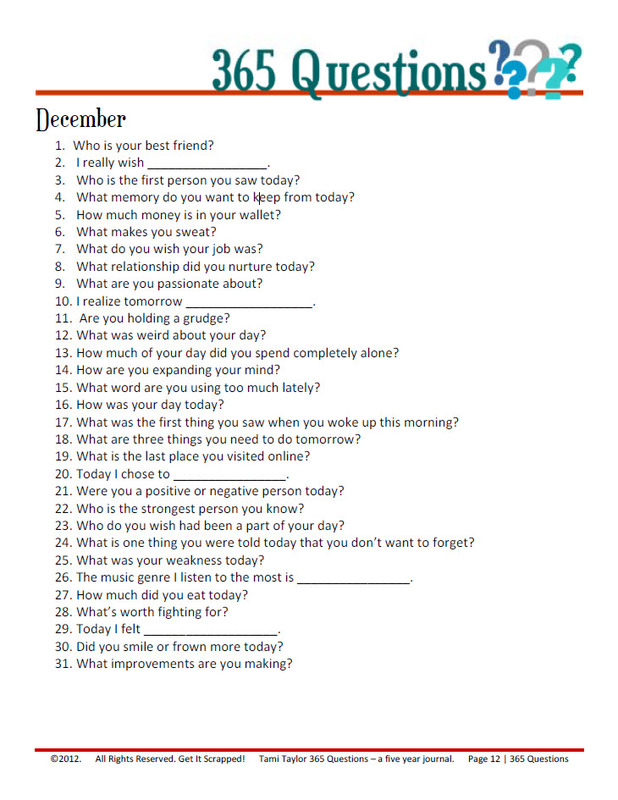 I stumbled across a small book that did have a question listed for each day of the year. Not knowing what my lesson topic was supposed to be on, so I find it quite interesting to learn about that book prior to my lesson. Anyway I am making a copy of each of the months for my kids in hopes it will prompt them to write in their journals with fun and interesting topics as those you have listed. You have blessed many lives by doing this. Thank you! I have never had time to keep a journal and I am now retired and wish I would of made the time. I decided you are never too old to try something new and love the idea you have with the 5 year journal. I hope I can do the 5 and maybe even 10 who knows. Checking in for month number 6. Tough to keep up, but I am going to keep trying. I would have hoped some type of habit would have kicked in by now, but I find myself catching up in spurts. Thank you so much for doing this and posting it for us all to use. I use a Bullet Journal and plan to incorporate this into my days. Thanks! I started keeping ten-year journals for my kids so they have some kind of record of their young years. Several years into it now, it’s really fun for me some days to compare this year to previous years. I decided to try it for myself, and these prompts look like just the thing to help me. Thank you so much for sharing these.